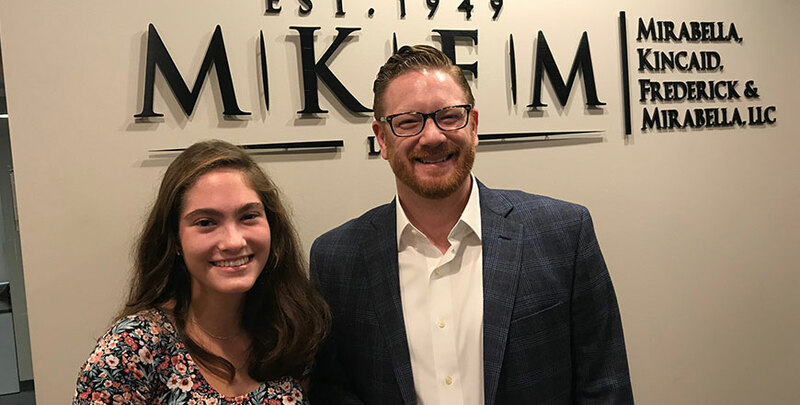 MKFM is pleased to announce that Brandon Bennett is the winner of the 2018 MKFM Giving Back for Reimbursement Program and Kathleen Ryan is the runner-up. Brandon Bennett received $2,500 and Kathleen Ryan won $1,500. Thank you to all finalists and voters! We hope the college reimbursement program helps students like Brandon and Kathleen achieve their education and career goals. For more information about the 2018 college reimbursement program or to consult a divorce or family law attorney, contact MKFM Law. Call 630-665-7300 or contact us online. Evening and weekend appointments are available. College education is a significant expense for students and families. At MKFM Law, we value education, and we are fortunate to be able to show gratitude and appreciation to our family of clients. That is why we created The MKFM Law Giving Back For College Reimbursement Program. 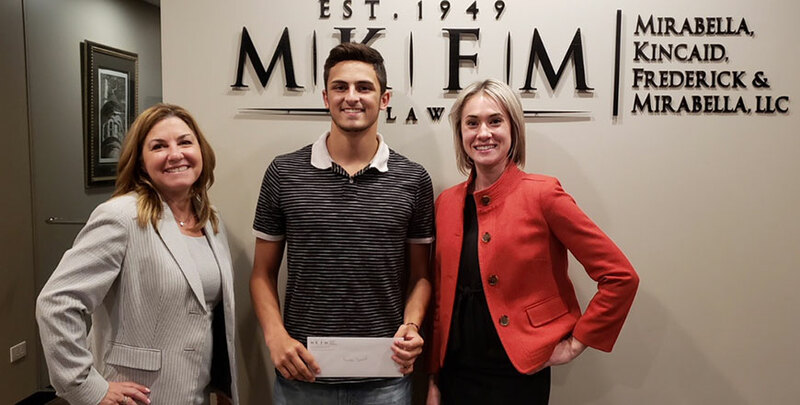 MKFM Law is pleased to be offering reimbursement funds of up to $4,000 to individuals currently attending or planning on attending college or graduate school in the near future. The MKFM Law Giving Back For College Reimbursement Program is open to all current and former clients of MKFM Law and their children. All applicants must be 18 or over. When you look back at your life in thirty years, what would it take for you to consider your life successful? Applicants must include their name, date of birth, address, e-mail address, phone number, and how they are related to a client of MKFM Law so that we may confirm eligibility. Applicants should also indicate where they are currently attending or planning to attend school in their submission. Only one submission per applicant is allowed. Previous winners are not eligible for additional contest entries or monetary awards. Out of the pool of eligible applicants, we will choose up to 5 finalists. Those submissions will then be posted on our social media pages and added to our voting poll. Once we post your essay or video onto our social media page, it's now your turn to gather support. The finalists will be responsible for promoting their entries within their social media networks by getting their friends, family, and followers to vote on the MKFM Law Facebook page poll. The winner(s) will be determined by the amount of votes received on the Facebook poll. The two finalists with the most votes on the MKFM Law Facebook page on (TBD), will be the winner and runner-up. Prize: The winner will receive a one-time reimbursement of previous money paid to MKFM Law, up to $2,500. The funds will be paid to the current or former client of MKFM Law, which can be used by the current or former client of MKFM Law to pay towards college expenses for themselves or their eligible child. The runner-up will receive a one-time reimbursement of previous money paid to MKFM Law, up to $1,500. The funds will be paid to the current or former client of MKFM Law, which can be used by the current or former client of MKFM Law to pay towards college expenses for themselves or their eligible child. Ownership of Entries: All entries submitted to MKFM Law in connection with The MKFM Law Giving Back For College Reimbursement Program, along with all copyright, trademark, and other proprietary rights associated therewith, become the property of MKFM Law upon submission. Entry materials will not be returned to any entrant. By submitting an entry, you acknowledge that MKFM Law will own all rights to use, modify, reproduce, publish, perform, display, distribute, and promote the presentation in perpetuity without compensation to you or any other person. Use of Name, Likeness, Etc. : As a condition of entering The MKFM Law Giving Back For College Reimbursement Program and receiving any reimbursement, each winner and runner-up will be required to consent to the use of their name, age, area of residence, and school name. You will also be required to be interviewed for any publicity for feature stories and any print, online, or television materials. You must consent to using your likeness and prize information, without limitations, for promotional purposes without further payments. Release: By entering The MKFM Law Giving Back For College Reimbursement Program, you agree to release and agree to hold harmless MKFM Law, Mirabella, Kincaid, Frederick & Mirabella, LLC, and each of their partners or employees, from any liability whatsoever in connection with entering The MKFM Law Giving Back For College Reimbursement Program, accepting any monies, or anything that may arise related to the same. Entrants agree to be bound by these official rules and the decisions of MKFM Law.